Stop having a push-and-pull relationship with success As many of those in the marketing world may have realised, the advertising age is coming to an end — especially for social media marketing. The thing with advertising is that it is more of a “push” marketing strategy. What this consists of is sending out your brand […] The post Stop pushing, start pulling and actively rejuvenate your brand appeared first on e27. As many of those in the marketing world may have realised, the advertising age is coming to an end — especially for social media marketing. The thing with advertising is that it is more of a “push” marketing strategy. What this consists of is sending out your brand or information of your brand to your audience. With this controlled nature of marketing, there is not much room for creativity. Push marketing strategies take a more in-your-face form which brings the information to the audience. On the other hand, the “pull” strategy puts a modern twist on marketing whereby the customers are the ones who come to the brand. Instead of sending out mass messages to a group of users on any known social media site, the pull marketing style allows for the customers to engage with the brand through the use of appealing content. Essentially, customers are able to create a relationship with the brand. They can share information about the brand to others who then become customers themselves. While we were planning a balanced approach to marketing this mattress reviews blog, we knew we would need a perfect combination of PUSH and PULL strategies to leverage out immediate as well as long-term benefits. In the launching phase, this blog applied push tactics but — when it came to the branding overhaul, pull was the finalized choice without any thought. 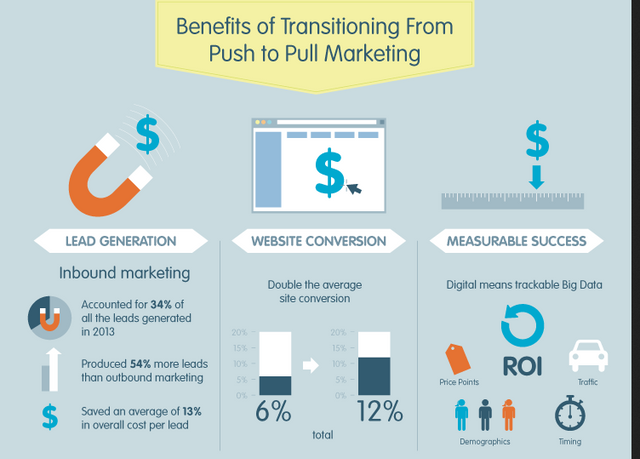 Why is pull marketing so vital? Have a company sending you a bunch of e-mails telling you to check out their brand which you may or may not be interested in? Have another company which you do have interest in a tweet you in response to a post you have recently shared? Most people, especially in this day and age, would prefer the latter. With the plethora of social media outlets available to us today, it is simpler for brands and companies to connect with users in order to bring more traffic to their product. But those who are not updating their methods in accordance with updates in technology and social media might be making the biggest mistake. Some companies are still stuck in the ‘advertising-age’ and the push strategy of marketing which, most times, is actually pushing their clientele and audience away rather than bringing them to their product. Additionally, those companies who are still using the push strategy are also losing money. Rather than gaining money for their companies or brands, marketers are paying more money for an audience size which is increasingly shrinking. For example, companies are putting more funding into the commercials that air on television, yet fewer people are watching these advertisements, and even fewer are requesting the brand’s product. To better adapt to this shift of digital media and marketing, it is important for companies to begin to use the pull marketing method. Those using this method do not push information and products to a large audience. Rather, they wait for the perfect time to pick the best-fit consumers to come to the brand. For instance, Mary may tweet about her support of a certain policy. A company which has a mission or goal similar to this policy can take this opportunity to respond to her tweet. In this tweet, they may clearly describe that their mission or goal of the company is similar to her interests and link their website. This, as opposed to pushing advertisements out to a mass of Twitter users, will be immensely more effective for company and brand growth. It will also be a great opportunity to create a lasting relationship with Mary and all other users the company interacts with. Generally, the consumers are the main focus for the company rather than to focus on the product. The consumers are the ones requesting this product, therefore, making sure they have an excellent customer experience is crucial to a brand’s growth. The product should not be the main focus, especially not the price of the products. What matters is the cost of producing and distributing the product and the profit that comes from this marketing. Instead of throwing the brand out there to everyone, it is essential to only reach out to those who will be interested in the brand and who will be willing to share the brand through word-of-mouth (or a consumer sharing a brand with other consumers) communication. Lastly, communication and engagement with consumers is the biggest factor necessary to build relationships through social networks. When brands engage with their consumers and meet their needs, it is more likely that it will gain consumer loyalty more effectively than if it only promoted their product. All in all, it is important to remember that the predominant focus is that as opposed to wasting resources and time advertising to anyone who can be reached, customer engagement with the right people can mean a lifetime of loyal consumers for a growing brand. So just how far does surprise-and-delight marketing really need to go? Is it more effective on a larger scale or does a little bit go a long way? Blue-chip brands with bigger budgets have invested in surprises on a larger scale, such as staging flashmobs of actors and dancers that break into choreographed routines promoting a brand’s message in public areas. Though this might be construed as more of a gimmick (as opposed to reaching out to individuals on a personal level), you need only look at the expressions of unsuspecting participants, which are usually those of joy and elation. In some cases however, the more intimate and enclosed the space is, the better. For example, the collaboration between the Copenhagen Phil and Radio Klassisk to play Edvard Grieg’s beautiful Peer Gynt on a metro train came, as such a surprise, it reduced several commuters to tears. Examples of simpler, less elaborate surprise and delight marketing might include Kleenex’s ‘Feel Good’ Facebook campaign. The Israeli creative agency Smoyz selected fifty people whose Facebook statuses appeared under the weather, then acquired the addresses for these users through friends and family, and sent Kleenex kits to the individuals to help them feel better. Every single recipient shared their surprise delivery by posting pictures on the network, and Kleenex received an astounding 650,000-page impression as a result of only — 50 boxes of tissues. This campaign in particular highlights the role of social media in surprise-and-delight marketing and how the smallest of personal gestures can result in a rippling effect of sharing across Facebook and other social networks. The aim behind surprise-and-delight marketing is simple: making someone feel unexpectedly good and hope that they might pass it on. ‘Going viral’ is the new word of mouth, and as a result of one person’s desire to share content, a brand achieves wider coverage with the added fuzzy feeling attached. Radio Klassik’s memorable flashmob video certainly garnered the right attention, now having been viewed on YouTube over six million times. It was T-Mobile who set the flashmob trend in the UK, achieving similar success with their flashmob advertisement in Liverpool Street station a few years prior, as hundreds of dancers surprised passengers by breaking into a medley of routines on the platform, closing with the simple slogan ‘Life’s for sharing’. It would seem that many brands are cottoning on to this, from pulling heart-warming stunts in public spaces to offering small, unexpected rewards to consumers, even if it is just a cup of tea or a packet of tissues. Sometimes, offering a little extra this way can prove just as effective as the big budget, ambitious advertising campaigns that now flash before us. One thing for certain is that nine times out of ten, surprise-and-delight marketing will always go down a treat. The post Stop pushing, start pulling and actively rejuvenate your brand appeared first on e27.